Alexander Nevsky A PLAY FOR RADIO AND A PROKOFIEV UK PREMIÈRE. 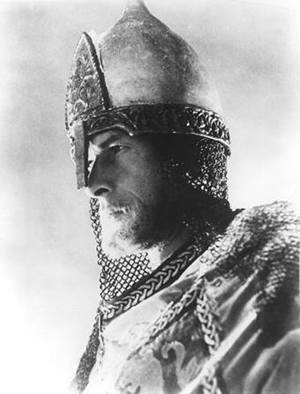 Nikolai Cherkasov as Alexander Nevsky in the Eisenstein film. 1 The Listener was a BBC publication which, together with articles of topical interest, readers’ letters and its own critics’ reviews of plays, films, musical performances etc., published the text of talks broadcast by the BBC. Churchill’s speech, entitled The Fourth Climacteric (the other three turning-points, according to Churchill, were the fall of France, the success of the Battle of Britain and the passing of the Lease-and-Lend enactment in the USA Congress), appeared in the 26 June 1941 issue; the speech was also issued as a gramophone record (HMV ALP 1556). 2 Orwell, George, “Nineteen Eighty-Four”, The Complete Works of George Orwell Vol. 9, ed. Peter Davidson, (London: Secker & Warburg, 1984), 5. 3 Williams, W. E., 28 August 1941, The Listener. 4 Olivier, Laurence, Confessions of an actor: Laurence Olivier, (London: Weidenfeld & Nicolson, 1982), 162. At first light on Sunday 22 June 1941, the shortest night of the year, on a front of over a thousand miles, “Operation Barbarossa” – the invasion of the Soviet Union by German forces of some two and a half million men – began. The consequences of this event, together with the Japanese attack on the American naval base at Pearl Harbour later the same year, would ultimately decide the outcome of the Second World War, but all that was in the future. At this juncture of the war there were two developments that Churchill and his War Cabinet in London desired above all else: the USA’s entry into the war on the side of the Allies and for pressure to be taken off Britain by Hitler’s opening a second front. The invasion of the Soviet Union gave Churchill his second wish, but now his immediate problem was how to make the Soviet Union, Britain’s new ally, acceptable to the British public. How could the Soviet Union – the self-proclaimed opponent of the Western capitalist world, hotbed of revolution, disseminator of Communism, invader of Finland and signatory of the Molotov-Ribbentrop Non-Aggression Pact of August 1939 – be made to lose its dubious image in the eyes of the British public? How Eisenstein’s film Alexander Nevsky, in the improbable form of a BBC radio play, and Prokofiev’s music became one part of the campaign to win over the minds and sympathies of the British public at one of the most critical moments of the Second World War, is the subject of this article. The dissemination of information (and misinformation) is a vital part of modern warfare, particularly in the sustaining of civilian and military morale, and from 3 September 1939 when war was declared, the UK media – film, press and radio – had been subject to strict control. The BBC’s output was largely the responsibility of the Ministry of Information, housed in the recently completed University of London’s Senate House in Malet Street, next to the British Museum. The exterior of this building served as inspiration and model for George Orwell’s Ministry of Truth in 1984 – “The Ministry of Truth – Minitrue in Newspeak – was startlingly different from any other object in sight. It was an enormous pyramidical structure of glittering white concrete, soaring up, terrace after terrace, three hundred metres into the sky.” (2) Even before the invasion of the Soviet Union, the Ministry of Information had regarded as a matter of vital importance, the Government’s attitude to the Soviet Union, and consequently how it should be presented to the British public. As elsewhere in the country and in the government, there were divided views – one member of the Ministry thought that the Soviet Union would be able to hold out for six weeks at the most, and Churchill’s own admitted hostility to Communism and fear of how communism might prevail if the Soviet Union triumphed in the war, made it imperative that a consistent approach should be adopted. It was decided that the British public should be given more information about the Soviet Union and its peoples – their ways of life, traditions, history and culture. In the inter-war years “Bolshevism” had terrified many – it was now time for the public’s re-education. The emphasis was to be on Russia’s pre-Revolutionary history and culture and the public’s attention was to be drawn away from less attractive aspects of the Soviet Union’s recent past. In 1940, the BBC had approached Belfast-born poet Louis MacNeice (1907-1963) to write for them, suggesting as subject matter “some aspect of Nazism and its influence or its victims”. MacNeice had been a familiar figure of the London literary scene in the 1930s. On return from the USA, where he had been teaching at Cornell University, he was interviewed by the BBC and, in January 1941, engaged to write scripts that would both contribute to national morale and also appeal to American sympathies. A member of the BBC Features and Drama department commented at the time: “We in this country have not yet been able to secure a first-class poet for such radio programmes”. They found one in MacNeice. Between February and December of his first year at the BBC, MacNeice produced a script a month. A major assignment for the BBC from the Ministry of Information, was for a programme that would convey to the Americans the government’s gratitude for the transfer of fifty American destroyers to the British navy as part of the Lend-Lease agreement, which had been signed in March. It was while MacNeice and his producer were on a nine-day North Atlantic patrol on the re-named HMS Chelsea, to acquire genuine atmosphere for their feature, that the captain picked up on his radio the momentous news that the Soviet Union had been invaded and, as a consequence, was now Britain’s ally.